Sri Ram is the embodiment of peace. His mental peace was not disturbed at any time, in any state and by anybody. The laymen are disturbed and face mental agony even for trivial losses. SriRam was different. The previous day he was informed about his coronation. The arrangements were being made with great festivity. The very next day Kaikeyi called him to say” You will not be coronated king; nor can you earn on your own. You should retire to the forest for 14 full years.” Sri Ram’s face did not wither. He accepted it calmly, without any kind of resentment and proceeded to the forest. The loss of a kingdom, the sufferings of the forest life did not afflict any disturbance on his mental peace.He remained in absolute peace and contentment. “ One word well spoken is better than a thousand unneccessary words”- so say great men. SriRam spoke very kind words to one and all. He was amicable, social and friendly. He used to start a vista(conversation) on his own accord. He conversed according to one’s ability and comprehension. He spoke to Sabari on Dharmas, to Bharatha on political laws, to Kousalya on the Law of Women ( Sthree Dharmam). To Sita he conversed about the greatness of Kshatriya Dharma ( the Law of Warriorship). His speech was always gentle, beneficial, soft and laden with truth. If ever anybody admonished Ram he never retarded. For example Dasaratha had once instructed Ram to complete a political affair. 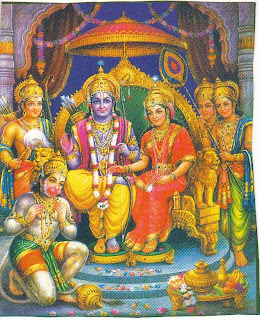 Sri Ram had at once executed it. However Dasaratha thought that the work remained unfinished. He admonished Ram for his negligence. However Ram did not retaliate. He remained silent. Sri Ram would never for instance ask “ Why do you unnecessarily admonish me. I have completed the given task”. However Dasaratha would somehow come to know of the completion of the work by Ram and would repent for having scolded him.